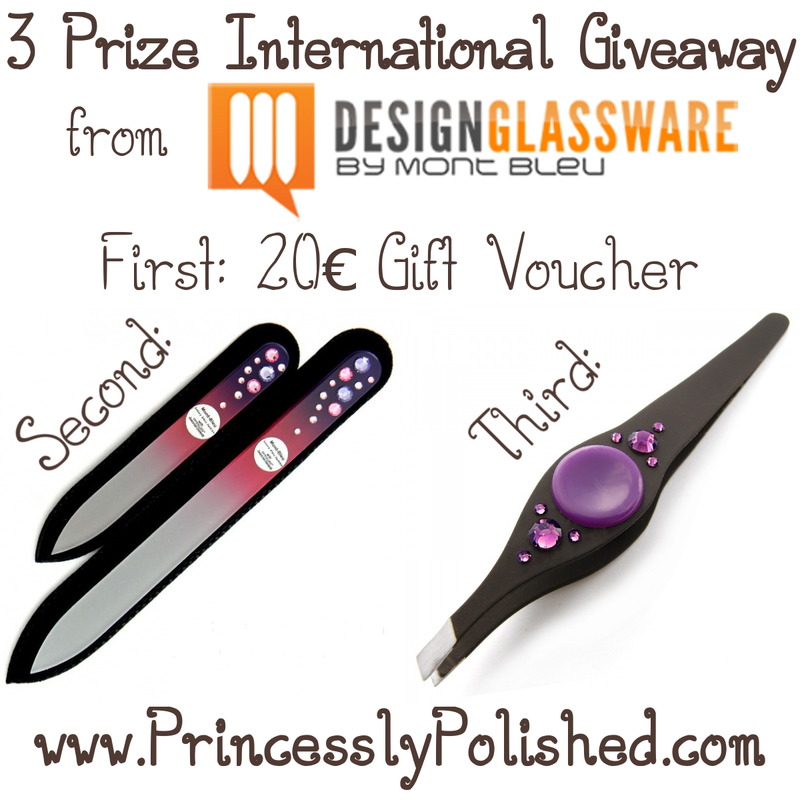 Princessly Polished: International Giveaway from Design Glassware by Mont Bleu! International Giveaway from Design Glassware by Mont Bleu! Hello everyone! I'm hosting a fantastic giveaway sponsored by Mont Bleu! Let's give them a big thank-you for the opportunity because these prizes are awesome, and they are available to everyone following Princessly Polished! =D What are you waiting for? Read on and get to earning those entries! This should be pretty obvious; 20€ to spend however you'd like! (While browsing the store you can easily switch currencies using the drop-down menu in the top corner.) They have so many pretty items that the only problem with this prize is having to choose what to buy! Check out my review of the glass nail files from Mont Bleu - they are fantastic! The third prize winner will get a pair of tweezers just like the ones I got to test and review! I absolutely love these, and I'm so happy to be able to share a pair with Mont Bleu's help! Mine are pink, and besides the purple you see above you'll be able to choose from pure black, clear crystal, light blue, pale green, yellow, or orange! What would you pick? This giveaway is open Internationally to all followers new and old! It ends July 25th, 2013. The selected winners will be notified by E-mail and each have 24 hours to respond before another winner will be chosen. I will put the responding winner in contact with Mont Bleu so they can receive their prize! I hope to win the glass nail files!! I love those nail fails! Have you seen the ones with hearts? Lovely! I love the Swarovski compact mirror ACS-06...so beautiful! 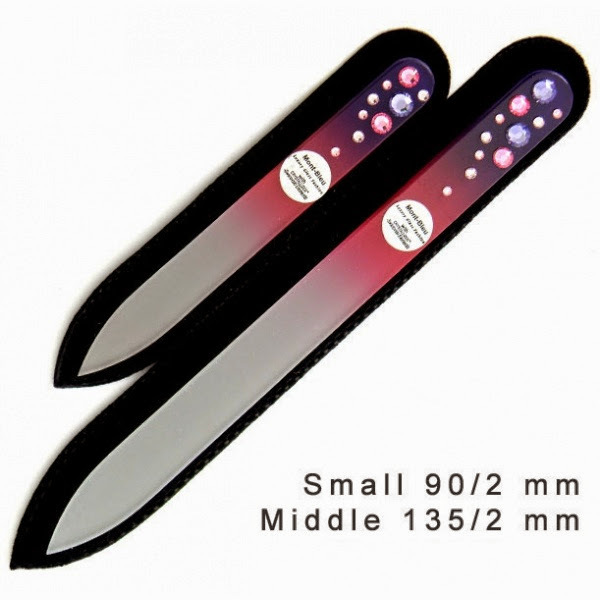 I love the crystal glass nail files! I love files from Zodiac line! The nail files are GORGEOUS!! I love the look of the mini glass nail files, I can never find a good small one! I love the nail scissors decorated! 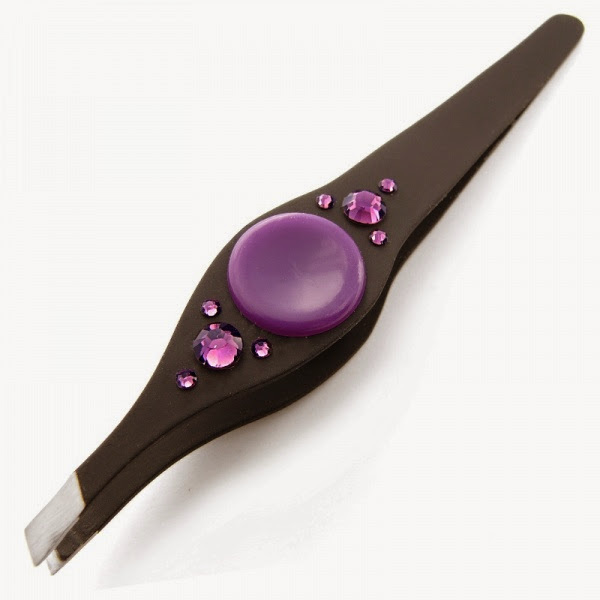 I love this one: http://www.design-glassware.com/crystal-line/218-swarovski-crystal-nail-file-b-m4.html Thank you for the giveaway!